A quote from an elevator mechanic in NYC: "You need to push the 'up' button to make the elevator come up. But pushing the button many times is not going to make the elevator move any faster." We continue to receive emails pointing to what some have called "a broken monetary transmission" in the US. On the surface the argument looks compelling. 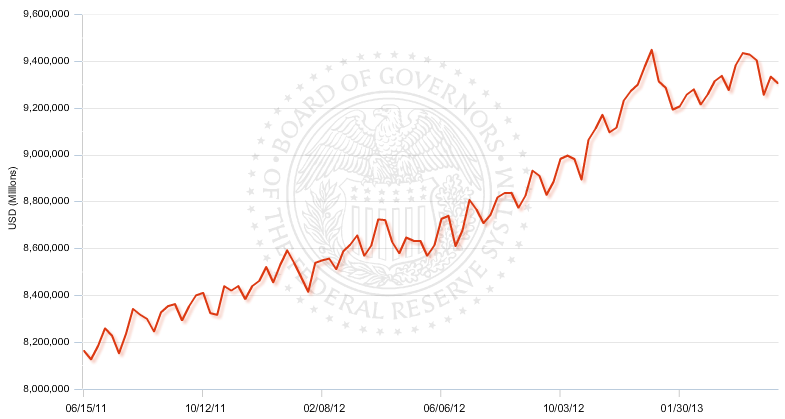 The Fed's securities purchase program is expanding the monetary base - the amount of dollars in the system. In theory some of those extra dollars should encourage the banking system to extend more credit than it normally would, ultimately growing the broad money supply (M2 for example). But that's not how things turned out. The argument goes that the banking system is broken and is unable to grow credit - which is being manifested as tepid growth in the broad money stock. Is that what's really going on here? A closer look reveals that the slow growth in M2 is driven primarily by the leveling off in the amount of deposits in the US banking system (in the chart below the monthly fluctuations reflect the payroll cycle). Note that the spike at the end of last year is the "income harvesting" prior to higher tax expectations (see post). But is this leveling off in deposits that unusual? How does it compare to changes in total deposit balances across US banks over longer periods? 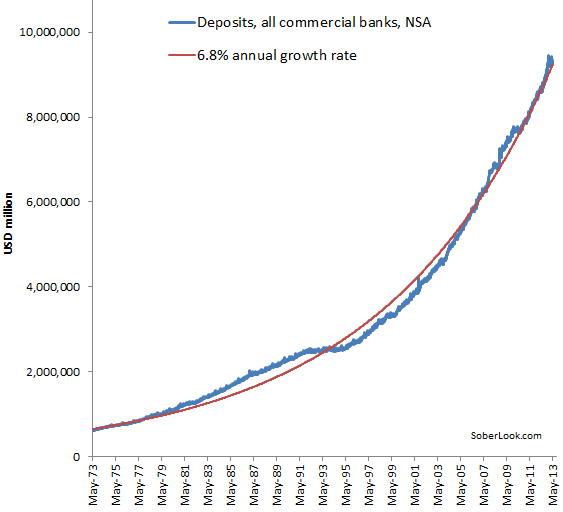 It turns out that the growth of deposits in the United States has actually been fairly steady - roughly 6.8% per year over the long run. The chart below shows a fit to 40 years of weekly deposit data. While deposit growth fluctuated over time, it has maintained a steady growth trajectory. Recessions, market booms, Fed's policy, reserve requirements, etc. have had a relatively minor impact on deposit expansion in the long run. And based on this fit, we are currently right about where we should be in terms of the overall deposit levels. The assumption that the banking system can generate unlimited amounts of broad money simply because the banks have been injected with record levels of reserves is wrong. Banks' capacity to grow credit has always been limited, and it's no different this time. The "monetary transmission" is not broken - it is simply constrained. The recent fluctuations are due to flows into stocks, mutual funds, short-term income funds (see post), etc. Deposits in the system will continue to grow at roughly 6.8% a year as they have done for the past 40 years, possibly longer. 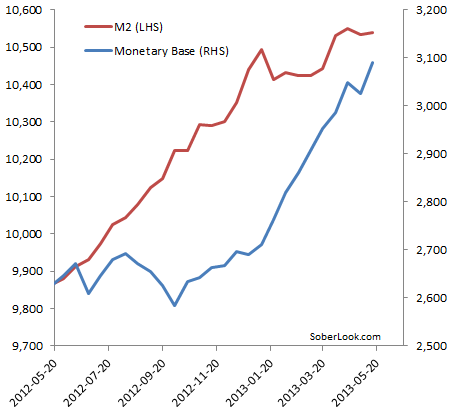 Therefore the broad money supply - a great deal of which are deposits - will never keep up with recent unprecedented growth in the monetary base (which is up 18% YoY). The elevator "isn't going to move any faster".